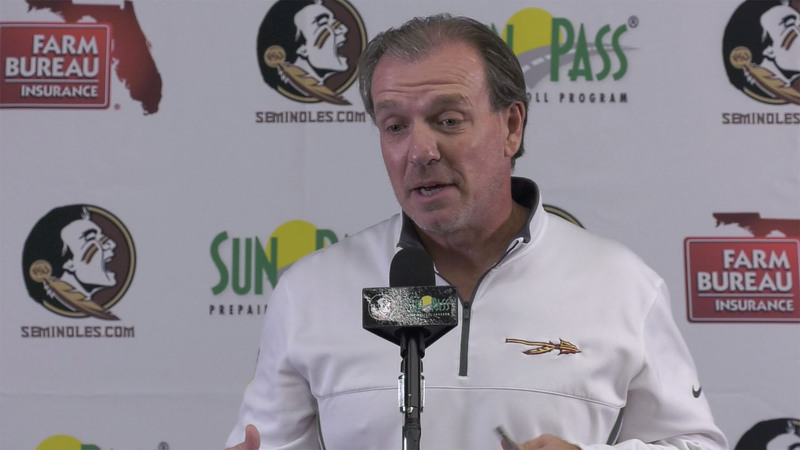 TALLAHASSEE, Fla. – Jimbo Fisher met with the media Monday to elaborate on last week’s 31-14 loss at Clemson and look ahead to Saturday’s homecoming matchup with Delaware State (noon, Raycom). Here are highlights from that conversation. A strong finish starts with one good performance: The Seminoles have three games to reach their goals of ending the season in a bowl game and potentially finishing with a winning record: at home against Delaware State, at Florida, and home against ULM. If the Seminoles play the way they did for much of the last two weeks, they’ll probably like their chances to reach those goals. Fisher said as much Monday, but also cautioned against focusing on anything other than this week’s matchup with Delaware State. The Seminoles beat Syracuse two weeks ago, and had the ball with a chance to take the lead in the fourth quarter at No. 4 Clemson. Fisher believes that those types of efforts – and continued improvement – would serve his team well as it moves forward. Senior Day still something to celebrate: Although FSU will have one more home game, the Seminoles opted to stick with their original plan of celebrating Senior Day this week, which means one more chance to recognize a number of the program’s cornerstones over the last few years. Stalwarts such as Derrick Nnadi, Matthew Thomas, Jacob Pugh and Nate Andrews are expected to participate in the on-field ceremonies. Trials and tribulations similar to previous years: The Seminoles have endured some difficult games this year, but, in some ways, the season isn’t all that different from some that previous teams went through on their way to better things. In 2011, the Seminoles dealt with an injury to starting quarterback EJ Manuel and had to rally through a three-game losing streak before bouncing back to finish strong, win a bowl game and springboard into a successful 2012 season. “We lost the quarterback, had a bunch of injuries, and then won a bunch,” Fisher said. Fisher isn’t the only one who sees the similarities. After that 2011 season, FSU went a combined 39-3 over the next three seasons with one national title and three ACC championships. QB Blackman continues to make progress: James Blackman’s baptism by fire continued in a big way last week, and, for the most part, Fisher believes that the freshman acquitted himself well at Clemson’s Death Valley. “Sometimes it shows up in results, sometimes it doesn’t,” Fisher said. “But his ability to have the game slow down and think and make the right decisions and do those things and how he articulates things, it’s ten-fold. Patrick emerges healthy, productive: Jacques Patrick made his return from knee surgery at Clemson, and left an impact with a three-yard touchdown that got the Seminoles on the scoreboard for the first time. Patrick finished with three yards on five carries, but Fisher said that the game flow forced the Seminoles to get away from the running game in the second half and that Patrick is still feeling fine.